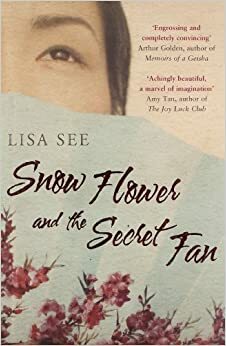 Lisa See is another author who actually tweeted me directly when I mentioned her work, which I feel was pretty special. Just by taking the time to acknowledge my interest in her work, I feel more inclined to pursue her writing and also continue researching the bizarre and fascinating tradition of foot binding. The beauty of this novel is that it follows the lives of women in a time and culture where women’s history wasn’t considered important enough to be recorded. Women were not allowed to make their mark on the larger ‘men’s’ world so they were forced to make a mark on their own, this is something that I find particularly fascinating. When I first read this book in 2006, I was a teenage girl with a best friend in school and had clear ideas of what life would be like. I loved this book for its elegance and the way the two main characters related to each other. That women were confined, literally and figuratively. Their feet were bound for ‘beauty’ but also so they couldn’t walk properly and they were kept in the women’s quarters upstairs, they wrote in their own language and did what they could within the restrictions imposed on them by tradition. I loved the grace of these women and how they managed to become the very best they possibly could with what was given to them. Now, almost 10 years on I appreciate this story from another perspective. Like the book is split up into the different parts of a woman’s life, I’m clearly on the next step of my own. I’m no longer close friends with my accomplice of 2006 and have absolutely no idea of what life will or should be like, I can see now the hardship and strength in all of the relationships in this book. These women were bound together by real love and were, despite having perfect lily feet and being ‘worthless branches on the family tree’, complete badasses. I think we (or maybe just I?) forget in the over indulgence of modern cinema, where kickass women wear a lot of leather and kick things in the face, that there are other kinds of more subtle badassery. Women who survive a world that doesn’t care if they live or die, who keep their children safe in the face of adversity and women who go through all of the above and still show kindness to those around them. In another 10 years, I suspect I will read this book again and I’ll see or feel something else in the story that I wasn’t able to understand this time around – I can’t recommend this book enough if you’re in the mood for something poetic and heart wrenching. It sounds like a very different, very elengant and profound novel. And I compeltely agree with you: there are different kind of badassery about women. I normally prefer the kind that dons’t need kicking in the face or weilding a weapon. Women’s strength is often more subtle than that, which is what this novel seems to be about. Indeed, the girls were badass. and ‘delicate’ compliments her writing well. I felt so angry while reading this book, but I couldn’t put it down.